Capsule Blister Packing Machine is on the basis of DPP-250F and widely absorbing the feedback information from customers and the advantages of same-type products at home and abroad. It is strictly made conforming to "GMP" standards. A waste material collecting device has been designed to add up to this machine which can make the function of the whole machine more perfect. Adjustable stroke: Freely change the size of sheet and suitable for the production of various kinds of specifications. Plate-type construction: It is suitable for packing the matter of any shape such as the special matters of square, triangle and oval shape etc. Positive pressing formation: That makes the bubble of cap wall uniform, stiff and smooth and makes the packing finished products standard and beautiful. Shaping, feeding, heat-sealing, pressing, lot number printing and cutting can be completed automatically in one move. Material recovery device: It can auto matically recover a whole roll of waste material. Capsule Blister Packing Machine is suitable for blister-type aluminum-plastic and paper-plastic sealed packing of such articles as capsule, tablet, syringe and hardware, etc. Looking for ideal Blister Packing Machinery Manufacturer & supplier ? We have a wide selection at great prices to help you get creative. 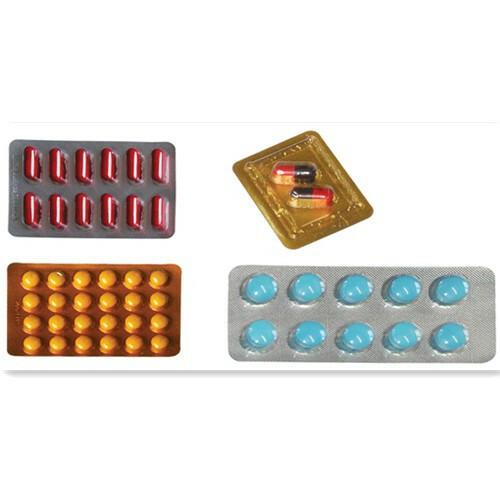 All the Capsule Package Machinery are quality guaranteed. We are China Origin Factory of Aluminium PVC Packing Machine. If you have any question, please feel free to contact us.